A few years ago Pittwater Online News attended a swim meet at Dee Why Rock Pool as part of the Winter Swimming Groups competitions that annually take place between Mona Vale, Narrabeen, Dee Why, Curl Curl and other clubs. The Dee Why Ice Pickswere hosting the comp. While there we saw some very able lady swimmers and heard a little about a local legend - Isa Wye. In January 2019 numerous members of the community requested a more definitive record be placed permanently where all may reach it at any time so this inspirational lady for whom the Dee Why Rock Pool will now be named - a suggestion first made by Vincent De Luca OAM in 2013 - may continue to inspire us all. Two immediately obvious people Isa inspires still are her sons Alex and Stuart, one is Club Captain at North Curl Curl, the other is immediate past Club President. Her son Alex said when we spoke to him that, "my whole motivation (for what I do) was seeing what mum did." Stuart Wye, who was elected as a Life Member of Surf Life Saving Sydney Northern Beaches at the annual presentation night in 2018, has served both the club and branch for well over 40 years. Alex “Wiz” Wye has been the Club Captain and later Director of Surf Life Saving for some 14 plus years at North Curl Curl SLSC. He has completed over 25 years of both Long Service to the Club and National Patrol Service. He’s a Life Member and recipient of the National Patrol Medal. So just who was this diminutive lady whose great spirit continues to inspire us all? Born on the 29th of December, 1921 at West Ryde, Isabella Jessie Holburn parents moved to Boronia Street, Dee Why in 1926. In 1926/27 Isa joined the Dee Why Ladies Amateur Swimming Club (D.Y.L.A.S.C) with best friend Myee Foster (nee Steele). Isa's father, Mr Peter Holburn was one of the founders of the Dee Why RSL Club with her assisting him extensively with the club's administration and her brother, Alex Holburn serving as a club Trustee for decades and her relative, the late Ted Jackson BEM OAM serving decades as the Club's President. Peter McDougall Holburn was born in Greenock, Renfrewshire, Scotland - Parish of Gourock. He was a WWI Veteran, enlisting on May 1st 1916 at 28 years and 11 months of age, a single man who lived at Balmain. He served in France with the 13th Infantry Battalion A.I.F.. Mr. Holburn was wounded in action on the 11th of of April 1917, suffering a gunshot wound to his left shoulder and back. The wound was so severe he was sent to England and then returned to Australia per the H.M.A.T. Pakeha. He arrived in Sydney in mid October 1917 and was discharged on January 11th, 1918. By that time he had a wife - Isabella Jessie (nee Alexander - born in Balmain South in 1895 to Andrew and Elizabeth) - they married in Balmain South and then lived at 66 Hill Street Leichhardt. Isa attended Dee Why Public School between 5 and 11 years of age and then the Manly Domestic Science High School in Darley Road, Manly, which was where Manly Public (or Village) School now stands. Isa was winning intra-school sprint competitions - see 1937 clipping below - and in 1936 was winning out of school swimming competitions as well. In 1936 Isa achieved 3rd Place (Bronze Medal) in the NSW Junior Women 's Breaststroke Championship. Margaret Dovey (Bondi club) won this race. Miss Dovey later became Margaret Whitlam - wife of the Prime Minister of Australia. "When in this race, Margaret was so tall and mum was short. Mum thought ‘how can I beat her, she’s so tall’." her son Alex explains. Newspaper reports of that year remark that Miss Dovey was the 'tallest girl in women's swimming'. A wonderful struggle between title-holder Pat Norton, of Bondi and clubmate Kitty Mackay, for the 100 yards championship of N.S.W., was the highlight of the N.S.W. Women's Amateur Swimming Association carnival at Coogee Aquarium Baths last night. Miss Mackay won by inches after a terrific battle over the last 20 yards. The two Bondi girls were first away and were on terms for 60 yards. Pat Norton touched first, but her stronger opponent gained a yard on the turn. Swimming strongly, Miss Mackay had established a two yards lead at 75 yards. Amidst tremendous enthusiasm, Miss Norton then made up ground; and the two girls touched almost simultaneously at the finish, with Miss Mackay receiving the verdict. The time, 63 sec., was a N.S.W; record, beating the 63 4-5 made by Miss J. Cooper, of England, in 1934. Clare Dennis, of Sydney Club, the Olympic record-holder, took the 220 yards breaststroke championship of N.S.W. without difficulty, in 3min. 2.2 3-6sec. She turned at 100 yards, four yards ahead of Margaret Dovey, of Bondi, and at 200 yards had increased her lead to eight yards. Taking things easily, she won by six yards from Miss Dovey, with the title-holder, J. Thomas, of Northern Suburbs, in third place. The time was 16sec. outside Miss Dennis's Olympic record. Clare Dennis was not pressed at any stage. Miss Dovey swam a great race against wonderful opposition. Miss Rawson created a State Junior 60 yards record of 29 1-10sec. in winning the first heat of that title event. N.S.W. record. 200 Yards Breaststroke Championship of N.S.W. — Miss Clare Dennis (Sydney) 1, Miss M. Dovey (Bondi) 2, Miss J. Thomas (N.S.) 3; time, 3min. 22 3-5sec. 60 Yards Junior Championship of N.S.W. — Final: M. Rawson (Bondi) 1, Miss L. Shard (Syd.) 2, J. Walsh (Manly) 3; time, 20 2-5. 60 Yards Handicap.— First Semi-final: B. Bardsley (Syd. ), 32 4-5sec. Second Semifinal: B. Winn (Bondi). 32 2-11sec. 100 Yards Handicap. — First Semi-final: H. Ross (O.-W.) 1. J. Greeves (C.W.) 2, E. Cevasco (R. and C.) 3; time, 1.25. Second Semi-final: U. Cashmere (Man. )- 1, W. Svenson (Syd.) 2; time, 1.14'2-S.
25 Yards Handicap Final. — J. Holburn (Dee Why) 1, E. Cocksedge (Bondi) 2; time, 21 4-5. 50 Yards Backstroke (Mrs. Halse Rogers's Handicap). — First Semi-final:. M. Crocker (C.-W.) 1: time, 42 1-5. Second Semifinal: B. Winn (Bondi) 1; time, 41. Pat Norton, who made a gallant effort in the State sprint championship last night. The new woman sprint champion of New South Wales, ..Kitty Mackay (right), snapped last night after having wrested the title from Pat Norton. On the left is M. Dovey, who finished second to Clare Dennis (centre), in 'the 220 yards breaststroke' championship. The Speedo Cup series of 50 yards backstroke, breaststroke, and freestyle, and 100 yards free-style, for Junior girls under 14, was won by Miss Isa Holburn, of the Deewhy club. This is the first time that a Junior from the northern side has won the cup. Winning relay team at Manly Domestic Science School swimming carnival yesterday. From left: B. Green, G. Howes, I. Holburn, and M. Steele. AMUSED. — Some of the barrackers at Manly Domestic Science School swimming carnival yesterday. In March Isa's friend Myee won the 220 yards NSW Junior title - the win was the forerunner of more great results that led to Myee being selected for the 1938 Empire Games held in Sydney from February 5th to 12th. Without being extended, Miss M. Steele, of Manly, shattered the State junior 220 yards record by 8 1/5 sees, in winning the title race by 10 yards in 2.50 3/5 sees., at the N.S.W. W.A.S.A. championship carnival at Coogee Aquarium last night. Miss Steele led from start to finish, and won from L. Shard (Sydney) and V, Scales (Rnndwick and Coogee). After leading all the way. Miss M. Dovey narrowly won the 100-yards junior breast-stroke championship of New South Wales from the fast-finishing Joan Thomas, of North Sydney. Miss Dovey's time of 1.23 4-5 seconds shattered the record by 2 1-5 seconds. MORE than 350 girls, representing 23 schools, competed at the fifth annual swimming carnival of the Domestic Science Schools, at the Domain Baths to-day. The schools were: Arncliffe (A), Bankstown (Bq). Bondi (B). Bourke-street (BS). Burwood (Bur), Canterbury (Ca). Croydon (C), Darlinghurst (D). Gardener's-road (G), Hamilton (H). Hurstville (Hu). Kogarah (K), Leichhardt (L), Manly (M).Maroubra Junction (MJ). Newcastle (Ncl). Newtown (N), Parrnmatta (P), Paddington (Pad), Randwick (Rwk). Riverside (R). Willoughby (W), WolIongong (Wol). When the first event commenced at 10.30 a.m. there were nearly 5000 spectators, and hundreds were still streaming into the the baths. Myee Steele set new records in her heat of the 100 yards open championship (66 2-5 sec.) and her heat of the 14 years 50 yards championship (29 1-5). The previous record for the 100 yards was 67 1-5. and for the 14 years race of 30 1/2.. Miss Steele, who is a member of the Manly Swimming Club, recently won the New South Wales 220 yards junior championship in the record time Of 2.50 2-5. Miss Steele established her third record, when she won the first heat of the senior breaststroke in 38 seconds, clipping one second off the previous best time. In the third heat of the 15 years championship, B. McPherson (WilIoughby) clipped 1 2-5sec. off the record. The senior 200 yards relay record was broken twice in the heats, Manly clocking 2.13 1-5, after Randwick had swum the distance In 2.17 1-5. For the first time Manly won the Kilminster Challenge Shield, the points for which were: Manly 73, Randwick 47, Willoughby 22. Results:— SENIOR CHAMPIONSHIPS Open 100 Yards. — Heat 1: J. Temple (M) 1, D. Esposito (Wol) 2. Time, 1.18. Heat 2: M. Steele (Mi 1. I. McKcnnv <K) 2. Time. 1.0 2-6 (record). Heat 3: A. Brown (L) 1, S. Furney (Pad) 2. Time, 1.21 2-5. Heat 4: B. McPherson (W) 1. J. Tuckey (K) 2. Time, 1.17. Final: M. Steele (M) 1, J. Temple (M) 2, B. Mcpherson (W) 3. Time, 1.8 3-5. 100 Yards.— Heat l: B. McPherson (W) 1, I. Holburn (M) 2; time. 1,14 2-5. Heat 2: S Henderson (Rwk) 1. A. Brown (L) 2; time, 1.17 1-5. Heat 3; G. Howe (M) 1, D. Esposito (Wol) 2; time ,1.14 2-5, Heat 4: J. Young (Bur) 1, J. Taylor (W) 2; time. 1.27. Final: G. Howes (M.) 1, S. Henderson (Rwk) 2, B. McPherson (W) 3. Time, l.ll. 50 Yards Breaststroke.— Heat 1: M. Steele (M) 1, E, Duggan (Ba) 2; time. 38 (record). Heat 2: J. Powter (W) 1. V. Solomans (B) 2 time, 41. Heat 3: B. Green (M) 1. N. Wheeler (Rwk) 2: time. 39 1-5. Heat 4: J. Hooton (P) 1. G. Young (Bur) 2; time, 45. Final: M. Steele (M) 1. N. Wheeler (Rwk) 2. B. Green (M) 3. Time, 40. 50 Yards Backstroke. — Heat 1: G. Howes (M.) 1, E. Quinsey (M.J.) 2. Time, 40. Heat 2: S. Henderson (Rwk.) 1, G. Bates (Ncle.) 2. Heat 3: B. McPherson (W.) 1, J. Babcock (Rwk.) 2, Time, 30. Heat 4: L. Howe (G.) 1, N. Radford (Ncle.) 2. Time, 41 3-5. Final: S. Henderson (Rwk) 1. J. Babcock (Rwk) 2. L. Howe (G) 3. Time, 39. 200 Yards Relay. — Heat 1: Randwick 1, Leichhardt 2, WilIoughby 3. Time, 2.17 1-5 (record). Heat 2: Manly 1, Newcastle 2, Burwood 3. Time, 2.13 1-5 (record). Heat 3: Wollongong 1 Kogarah 2, Parramatta 3. Time, 2.40. Final: Manly (M. Steele, G. Howes, I Holburn, J. Temple) 1, Randwick (J. Babcock, S. Henderson, M. Lleis, P. Sterritt) 2, Newcastle (G. Bates, J. Lemmich, P. Clarke, J. Wiver) 3. Time, 2.10. Diving.— I. Holburn (M) 1, J. Hooton (P) 2, M. Steele (M) and A. Brown (L) dead-heat 3. 220 Yards Junior Championship of New South Wales.— First heat: Miss M. Steele (Manly), 2min. 44sec., 1; Miss E. Cameron (Manly), 3min. 12 3-5sec., 2; Miss I. Crowe (Randwick and Coogee), 3min. 15 2-5sec.. 3. Miss Steele's time broke the existing New South Wales record. Second heat: Miss V. Scales (Randwlck and Coogee), 3mln. 1 1-5 sec., 1; Miss P. Riggs (Bondi), 3mln. 2 3-5 sec., 2; Miss M. Bailey (Randwick and Coogee), 3min. 8 4-5sec„ 3; Miss. N. Pike (Manly). 3min. 9 4-5sec., 4. Third heat: Miss M. Bartlett (Manly), 3min. 10sec., 1; Miss I. Holburn (Manly), 3min 11 3-5sec 2; Miss A. Lascelles (Manly), 3. Misses M. Steele, .V. Scales, P. Riggs, M. Bailey, and N. Pike, who registered the five fastest times, will contest the final on Saturday night. As well as all that swimming in school and W.A.S.A. (Women's Amateur Swimming Association) events, Isa came from and was imbued with serving her community. In 1938 Isa was elected Secretary of D.Y.L.A.S.C at just 16 years of age, the youngest person to ever hold this position. on the 28th of September 1947 she was awarded Life Membership of D.Y.L.A.S.C at just 25 years of age. Mrs Wye, with her younger sister, Jean Gee OAM were in the first ever Manly Y Women's Basketball (now netball) Team in the late 1930s that travelled to the city to play, because at that time there was no local netball competition, she was also involved in the foundation in the 1950s of the Dee Why Swimmers Netball Club. On October 22nd, 1949 Isa married Stanley Neil Wye at St. Matthew's Church of England, Manly. During the early 1950's they built a house with family assistance at 6 Jamieson Ave, North Curl Curl, where Isa lived for 60 years. On February 20th 1954 their eldest son, Alexander Neil, was born. January 21st 1956 their younger son, Stuart Douglas joined the living. "As little pre-school and early school day boys, evidently Stuart and I were taken along to club races, where I was told later on in life by Mum that some of the older girls loved taking turns keeping an eye on us whilst Mum officiated at the club swimming events." Alex explained. "Apart from her family, Dee Why L.A.S.C. was the most important thing in Mum's life and she was always keen to give back to the local community in the domain of amateur swimming, including assisting in the "learn to swim" programmes in her early days." Alex says. Mrs Wye went on to be a founding member of the Curl Curl Youth Club who with her family (the Holburns and Gees) helped build the Curl Curl Youth & Community Centre which was officially opened in 1967, and served on the Centre's Management Committee from its inception to 2012, she also served as foundation President of the Youth Club's Soccer section. Mrs Wye was also dedicated to veterans, particularly as her late husband had served in New Guinea. Isa contributed extensively to War Widows and served for several years as the local President of War Widows Guild. Mrs Wye dedicated her life to swimming, became involved with Dee Why Ladies Amateur Swimming Club (Australia's oldest ladies swimming club) at 5 years of age and by 16 became the youngest person to hold office as Honorary Secretary. In 1961 she was elected Club President, serving in the role for over 50 years. Isa was the second woman in National history to Referee at the elite swimming championships level. At the district level, Mrs Wye assisted with the foundation of the Warringah Amateur Swimming Association in 1964/65, with the merger of the Men's and Ladies Associations and was a foundation Executive Member. Isa later served many years as President, Senior Vice President and as the Convenor of the Officials Technical Committee and was Patron of the Association up until her passing. In 1971 she was appointed Manageress of the NSW Swimming Team to tour New Zealand. In 1972-75 she was elected President of Warringah Amateur Swimming Association (first term). For years, Mrs Wye together with others lobbied for an Olympic pool to be built in Warringah and in 1979 as Association president, officially opened the Warringah Aquatic Centre - In 2009 she was inducted into the Inaugural Warringah Aquatic Centre Hall of Fame. Mrs Wye in 1964/1965 became a foundation member of NSW Amateur Swimming Association after assisting with the merger of the Mens and Ladies Associations, was a veteran of the Association's Officials Technical Committee serving for over 40 years (that Committee tested and allocated officials to elite swimming championships). At national and international levels, Mrs Wye was an accredited Referee, Judge, Starter and Time Keeper officiating in Australia and internationally at the World Championships, National Championships, Pan Pacs, International meets and State Championships (as well as thousands of district and club championships across the state and nation). In July, 1975 she served as Manageress of the Australian Swimming Team to the 2nd World Swimming Championship in Cali, Colombia, South America. In 1980 she again became part of history when selected to manage the Australian Women's Olympic Swimming Team in Moscow. This was an extremely difficult time for swimmers and officials who were lobbied to boycott the Olympics because of the Cold War. Swimming great, Olympian Lisa Forrest wrote a book on the games, “Boycott” and in December 2012 at the Dee Why Ladies Amateur Swimming Club's 90th Anniversary spoke lovingly of Isa and the support she gave to the athletes. From 1982-91 Isa was a	FINA (international) accredited swimming referee. In 1982 she was elected Senior Vice-President and Committee Member for the Union of Old Swimmers, positions held for 30 years. In January 1991, while 69 years young, Isa Officiated at the 6th World Swimming Championships in Perth. In honour of Mrs Wye's outstanding service to the community in 1973 she was appointed by the Queen a Member of the Order of the British Empire (MBE). The medal was presented by the then Governor of NSW, Sir Arthur Roden Cutler. In 1984 the Union of Old Swimmers Natatorial award for Outstanding Contributions to Swimming was presented to Mrs Wye. On June 13th 1987 Isa was awarded Life Membership of New South Wales Amateur Swimming Association. In 2000 she was awarded the Australian Sports Medal ( and became a Sydney Olympic Games torch bearer, carrying the Olympic Torch on the NSW Central Coast). In 2002 the Medal of the Order of Australia (OAM) 'for services to the community, particularly in the domain of swimming' was presented by Marie Bashir - Governor of NSW. Isa was conferred Life Memberships of the Dee Why Ladies' Amateur Swimming Club, Warringah Amateur Swimming Association, NSW Swimming Association, The Australian Union of Old Swimmers. Warringah Council presented Isa with an Outstanding Community Service Award and in 2012 the NSW Parliament's Upper House resolved to congratulate her on her 90th birthday, 50 years as President of the Dee Why Ladies Amateur Swimming Club and her outstanding service to swimming and the community. Mrs Wye and her family have been the backbone of their local community since the early 1920s helping to establish some of the northern beaches most successful sporting and community clubs. Isa passed away on January 4th, 2013, just six days after her 91st birthday. Yesterday, February 2nd 2019, the annual Isa Wye Memorial Swim Day took place at the Dee Why Rock Pool with members and participants and friends meeting in the club house afterwards. Although a grey cool day with drizzle you could still feel the sun above those summer clouds and feel the warmth among those who gathered to celebrate a cherished lady. In the case of Isabella Jessie Wye, Isa, the living who belong to her numbers in the thousands - they are those who need to Learn to Swim, and those who like racing a netball down a court. They are those who have served in conflicts and their loved ones who need someone to look after them for a change. Her spirit thrives in the community still, through her children and grandchildren and all whom she continues to inspire to do what they can, and then do a little more - for each other. Isa remains in memory a kind gentle lady with a passion for the water and living life to the full who encouraged others to do the same. Next time you're splashing around in Dee Why Rocky Pool - the Isa Wye MBE OAM pool - or tossing a ball to a friend on a court during the cooler seasons, spare a thought for Isa and her very good friends who made a path for women, and men, during eras when no path for girls existed. An Extract - on Marjorie Smith OAM (Marjorie was a best friend of Isa, a founding member of Dee Why Ladies' Amateur Swimming Club, Warringah Amateur Swimming Association and the New South Wales Swimming Association - she is also the late grandmother of Vincent De Luca OAM). Marjorie Smith is an icon of the swimming world and greatly admired for her dedication to the community and particularly children and young people. She was the first woman to surf at Dee Why beach, Australia, and was the heart and soul of the Dee Why Ladies' Amateur Swimming Club for many years. Over a 70 year period she taught hundreds of thousands of children how to swim on a voluntary basis across New South Wales. In honour of her many years devoted service to the community she was awarded the Order of Australia (OAM) in 1991. She was awarded Life Membership of the Dee Why Ladies' Amateur Swimming Club (the oldest ladies swimming club in Australia) in 1961, Warringah Amateur Swimming Association in 1980, the New South Wales Swimming Association's Merit Service Award in 1985, the Australian Union of Old Swimmers Life Membership in 1976 and Dee Why Beach Netball Club in 1980. Marjorie Smith OAM (née Shade) was a much loved figure in the Manly Warringah area on Sydney's northern beaches after devoting all her life to others, particularly children. An icon of the swimming world, Marj was born in Drummoyne in 1911. She soon developed a love of swimming and surfing that dominated her life until her passing in 1996. Marjorie's family had a weekender at Dee Why on the northern beaches. She was the first woman to surf on Dee Why beach and was also a great body surfer. The history book states that 'even though young ladies were not permitted to join the Surf Club her ability in the surf was the envy of many of the local lads'. In 1922 she swam in one of the first ever invitational races of the Dee Why Ladies' Amateur Swimming Club, which is the oldest ladies swimming club in Australia. She would later become the heart and soul of the club, serving on its Management Committee from 1950 to 1996 and 18 years as the Club's Honorary Secretary. She was awarded Life Membership of the Dee Why Ladies' Amateur Swimming Club in 1961. For over 70 years Marj taught hundreds of thousands of children on a voluntary basis how to swim. Marj taught kids at Dee Why rock pool and also went into schools across New South Wales and to remote country areas teaching swimming for free. As a qualified swimming referee, Marj officiated at the National Championships, State Championships and various other championship events and school carnivals. She had a particular love of children and also assisted with the Disabled Games. Marj was a driving force behind the administration of swimming in New South Wales. She helped bring together the New South Wales Men's' Amateur Swimming Association with the New South Wales Women's' Amateur Swimming Association in 1964, worked in the Association's Office and served as an official for many years. In 1985 she was awarded the New South Wales Swimming Association's Service Merit Award in recognition of her outstanding service. In 1965, she was a foundation member of the Warringah Amateur Swimming Association and served on its Executive Committee for many years including as Honorary Secretary, Vice President and as a member of its Technical Committee. For many years she campaigned for an Olympic indoor pool to be built on the northern beaches. In 1979 the Warringah Aquatic Centre was finally opened while Marj was the association's Honorary Secretary. She was awarded Life Membership of the Warringah Amateur Swimming Association in 1980. In 1985 she was awarded the Warringah Shire Council Outstanding Community Service Award. She was awarded Life Membership of the Australian Union of Old Swimmers in 1976 and awarded the Natatorial Award in 1991. Also in 1991, she was awarded the Order of Australia (OAM) for her outstanding service to swimming. Her generosity of spirit is greatly remembered, she would always provide a helping hand to anyone. During World War II, she was an integral part of the community, supporting local families whose loved ones were at war. This was no mean feat as her own husband was at war and she was raising three young daughters. Marj was the foundation President of the Dee Why Beach Netball Club in 1975, serving for over 20 years on its Executive Committee. In 1980 she was awarded Life Membership. For the 80th Anniversary of Dee Why Ladies' Amateur Swimming Club, past members and present were asked to write about their most precious recollections. On Sunday 8 November 2009, Warringah Aquatic Centre celebrated its 30th birthday by paying tribute to the officials of Warringah Amateur Swimming Association who had made valuable contributions to the sport and who had also worked on the Olympic Pool Committee set up to advise on building the facility. Mrs Isa Wye, MBE, OAM, Mrs Joan Somerville, OAM, Mr Don Roberts, Mrs Sunny Bidner and Mr Jamie Jenkins were inducted. Also inducted posthumously were the late Mr Stuart Somerville, OAM and the late Mrs Marj Smith. in Sydney's peerless necklace of ocean Jewels Deewhy Beach Is a brilliant gem. It Is one of the most beautiful spots between Manly and Narrabeen — about seven minutes' walk from Pacific Parade, which will shortly be connected by tram to Manly. Dee why Beach has long been' known as one of the choicest picnic resorts around Sydney, but the great .spreading movement which Is now taking place is about to cause this spot to be embraced by the builder, and to become on ideal place of residence for those who either wish to retire In peace to some scene of peace and beauty, or to those who love to spend their week-end where the water is bluest, the sand softest, the surf gentlest, and the air most invigorating. This resort is now particularly in the public, eye because the famous Oaks Picnic Grounds, which have been known for years as one of Sydney's most attractive pleasure resorts, have been subdivided, and will on Anniversary Day be thrown open to the people for settlement. These grounds are beautifully situated. They are right on the beach front page at Deewhy Head, and command a scene where Nature reposes most gracefully. At the southern end, where the beach touches the estate, there Is fine shelter and a succession of flat rocks, amidst which are many clear crystal pools, admirable for bathing. From southerly busters or westerly gales It Is well protected, and those who make their homes here may enjoy all the pleasures of the sea side without any of its disadvantages. For the angler this will make an Ideal site for a home, as the schnapper grounds are on the 100ft. reservation outside the eastern boundary, while Long Reef is opposite and Deewhy Lagoon lies at the back of the beach. The 100ft. reservation from the high-tide line enables one to ramble amongst the rocks to view the cliffs 100 to 120 feet high, to study the peculiar pot-holes 10 to 12 foot deep, and to enjoy in the shade the glory of the Pacific. Not only is Deewhy Beach a perfect place for the residence of the city man who, having been confined to his desk all the week, needs a week-end home by the sea, where it Is most restful, but It Is a fine spot for the squatter who would spend his summer at the seaside or the retired man who is seeking health and, peace. As red as any rose. That no more sail the seas. 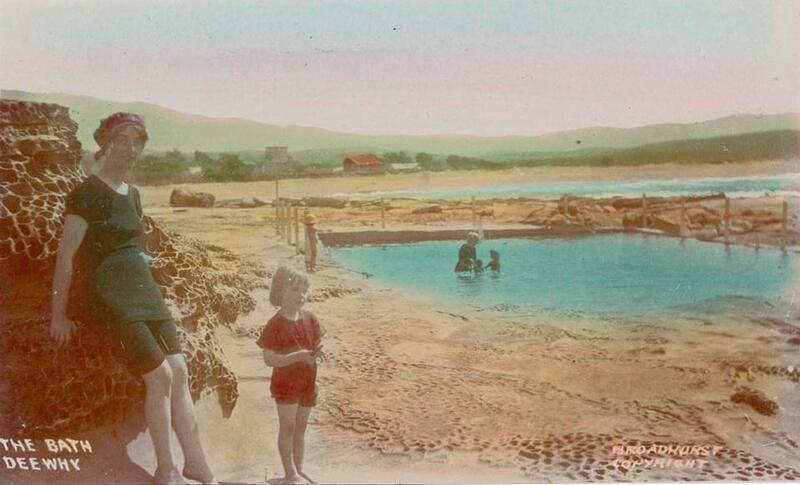 The Bath, Dee Why - from Album 'Scenes of Dee Why, N.S.W. ', ca. 1900-1927, Sydney & Ashfield : Broadhurst Post Card Publishers. Image No. : a105226h, courtesy the State Library of New South Wales. 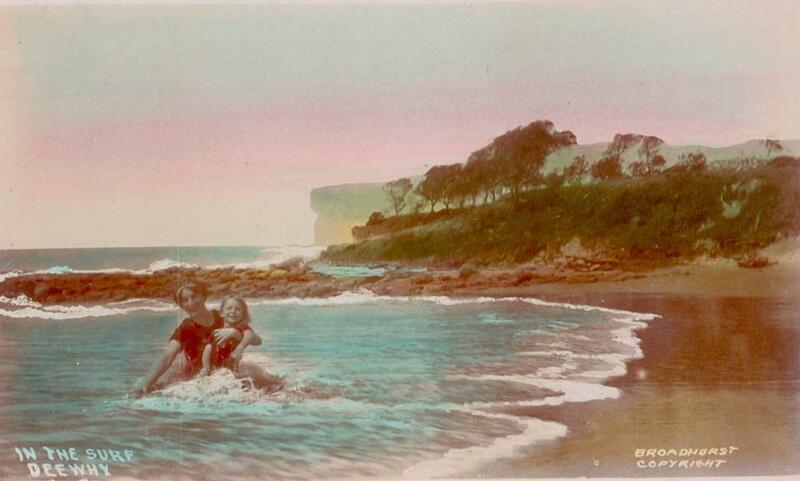 In the surf, Dee Why - from Album 'Scenes of Dee Why, N.S.W. ', ca. 1900-1927, Sydney & Ashfield : Broadhurst Post Card Publishers. Image No. : a105227h, courtesy the State Library of New South Wales.